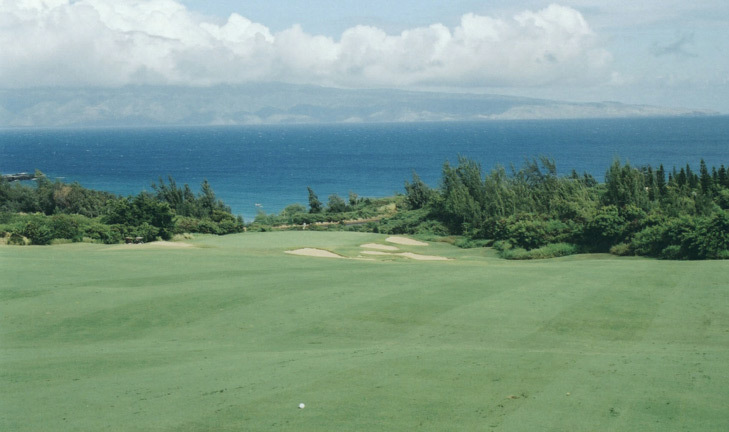 The Plantation Golf Course at Kapalua Hole 1: Standing on the first tee, one can’t imagine a better opening vista. With both Molokai and Lanai visible, the ocean a sapphire blue and the grass a vibrant green, the round starts on a high note. 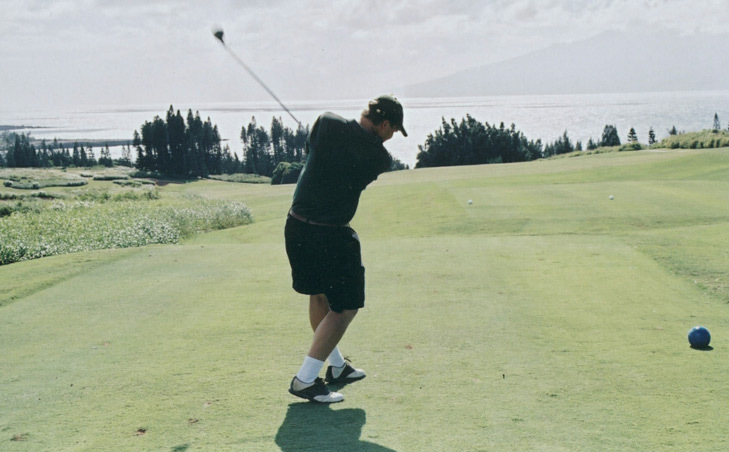 The golfer wouldn’t think that driver on a 473 yard hole it too much club, but it might be. This is a great opener with a frightening second over jungle and provides plenty of foreshadowing of shots to come. The Plantation Golf Course at Kapalua Hole 4: One of two holes on the Plantation course with steep uphill drives (the other is number 10), this one has a completely blind tee shot and must be taken seriously, with the golfer trusting his line and trajectory. Once on top, the approach is fairly simple, but for the tiered green. 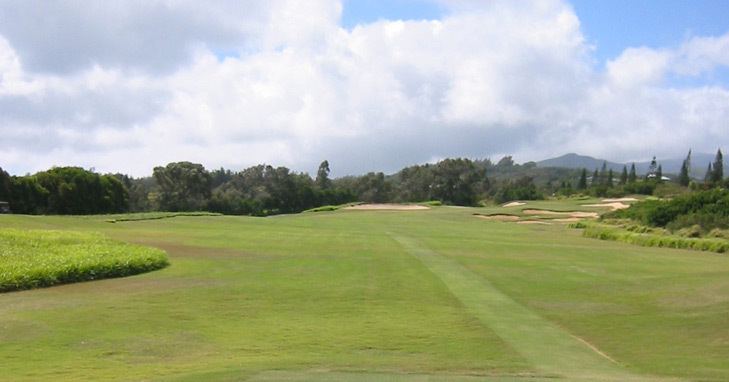 The Plantation Golf Course at Kapalua Hole 5: The first par 5 on the course is very memorable indeed. A relatively short dog leg right allows the player who hits a good drive to the right side of the fairway (by tempting the huge gorge to the right) to go for the green. That shallow and very wide and sloping green, however, is perched on a peninsula surrounded by jungle and bunkers. This is a beautifully designed golf hole from tee to green, with some of the best vistas from any putting surface in the world. 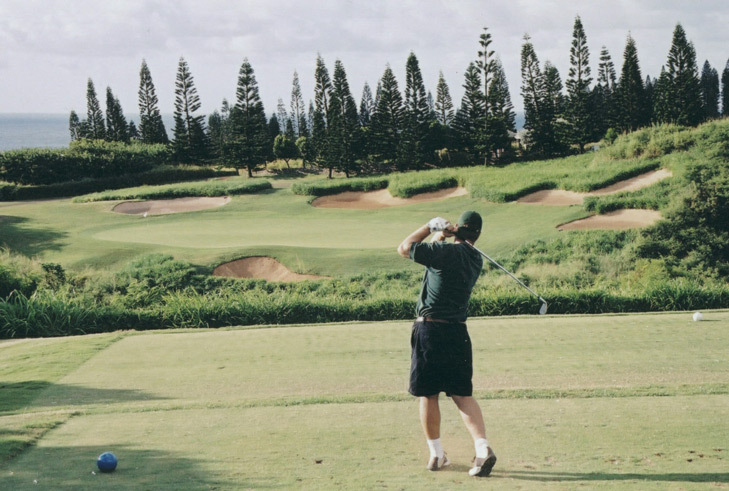 The Plantation Golf Course at Kapalua Hole 6: This par four has a difficult drive that must avoid gorge short and right and the huge bunker in the center of the fairway. The drive that ends up too short will be left with a blind second to possibly the most downhill approach in the world. The ideal shot will land well short of the green and at the left edge, allowing it to funnel down to the expansive green. However, anything hit right or long is gone and anything that gets hung up left will leave an impossible chip. A beastly drive in the right conditions can actually fly the bunker and roll almost to the green, but usually those awesome shots are reserved for the pros. The Plantation Golf Course at Kapalua Hole 7: Another sweeping downhill par four that is incredibly long, this one forces the player to take an aggressive line over the corner of the dog leg right in order to have an approach of less than 230. That approach, however, is wide open and way downhill, and provides the best view on the course. The Plantation Golf Course at Kapalua Hole 8: “Gorge” is a fantastic par 3. Simply put, miss anywhere and you lose your ball or have an impossible up and down. The green is shallow and heavily sloped, so the fun isn’t over till the ball is in the hole. This is an adrenaline creating tee shot for sure. The Plantation Golf Course at Kapalua Hole 9: At only 520 yards with an incredibly wide fairway including no bunkers, once steps up to the final hole on the front side feeling good. 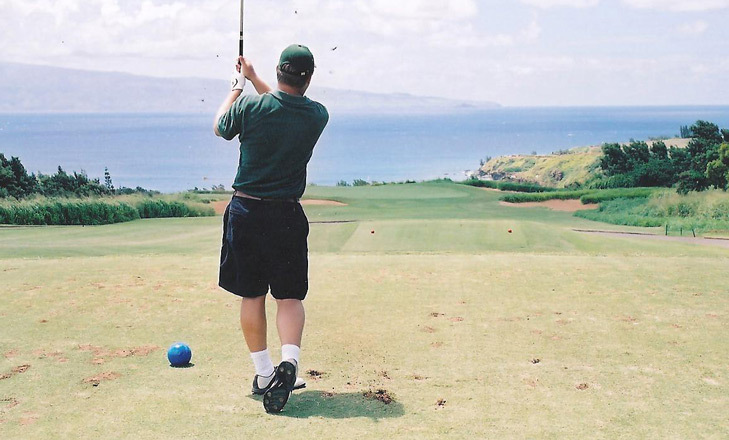 But then the trade winds have their say and the drive goes 30 yards shorter than planned. The second shot then has to cross a docile looking dip to get to the next plateau between bunkers. Then, a crushed 3-wood gets caught in the wind, the golfer realizes that dip is really quite huge, and comes up short or in the bunker, now leaving a long uphill approach to a green that rejects any shot short. 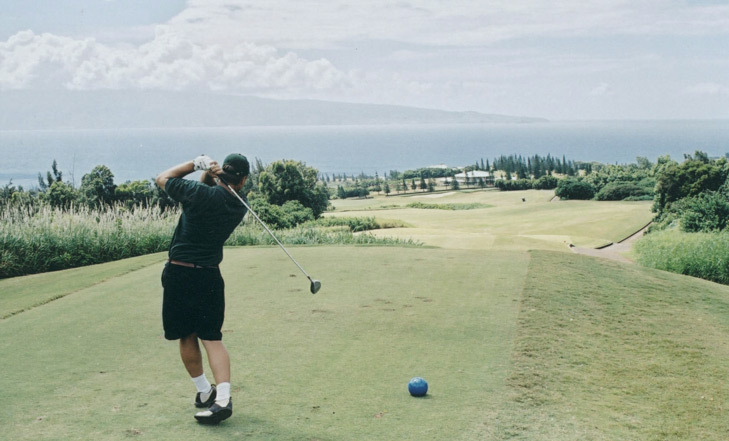 This is the sneakiest #1 handicap hole on a course anywhere in the world, so beware. 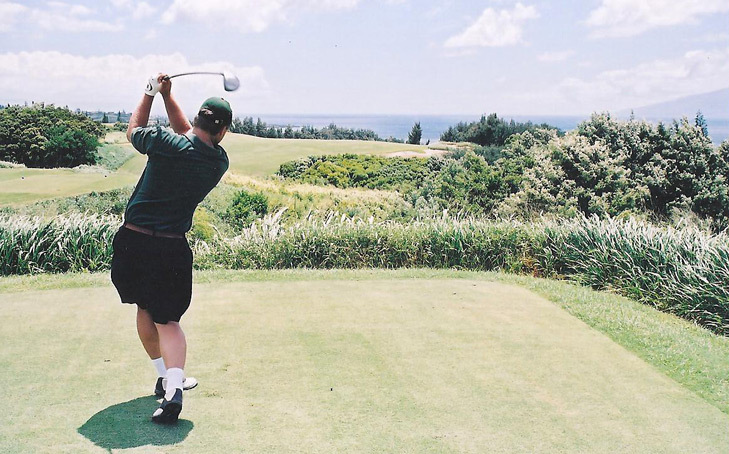 The Plantation Golf Course at Kapalua Hole 11: The only par three on the back side is a short, downhill affair with very wide views of the ocean and Molokai. The obvious dangers are the large bunker short / left and two to the right of the green complex, but going long is no picnic, unless the golfer actually were to bring a picnic, in which case it would be very nice, but otherwise, it is likely a lost ball and frustration. 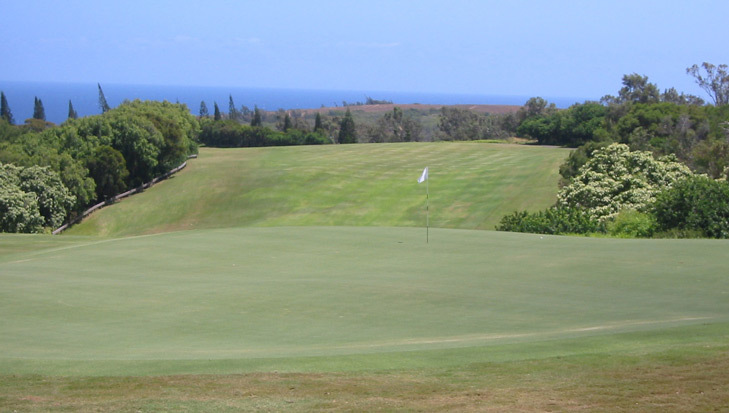 The Plantation Golf Course at Kapalua Hole 12: In strong trade winds this par four can be driven, even from 370 yards. Of course, that is dangerous given the steep slope of the rough to the right of the fairway down to oblivion, and the high grasses and bunkers to the left. The conservative drive will leave a short iron to a smallish green complex and the pot bunker about 50 yards short of the green is real trouble as well. The Plantation Golf Course at Kapalua Hole 14: This little par 4 is only 305 yards, and the fairway is wide open, which provides one of only a few breather shots on the course. The approach, however, is uphill to a well-guarded, tiny green. The green is so small, you can walk across it’s width in 10 steps, and it’s only 20 yards deep. With every other green on the course being huge, this is a fun change of pace. The Plantation Golf Course at Kapalua Hole 15: The only hole without a bunker weaves its way between junk left and right, then goes down a steep valley and up the other side to a green with a steep front that will reject anything short back down 50 yards or so, to leave an awkward chip. The Plantation Golf Course at Kapalua Hole 17: Another masterful downhill, sweeping par four, this one is the longest and provides the greatest challenge from tee to green. There is jungle everywhere and the second must carry a good deal of it to a very wide and sloping putting surface. The Plantation Golf Course at Kapalua Hole 18: The last hole of the day is also the most sweeping of the day, which is saying quite a lot. At 663, it’s long on paper, but 300+ yard drives are easy to come by. The second shot is the real masterpiece as the distance is incredibly difficult to judge and the layout of the land will make any ball roll left towards the ravine running down the left side of the hole. The green is snuggled up against that ravine and any left pin placement will make the knees shake on the last shot of the day. 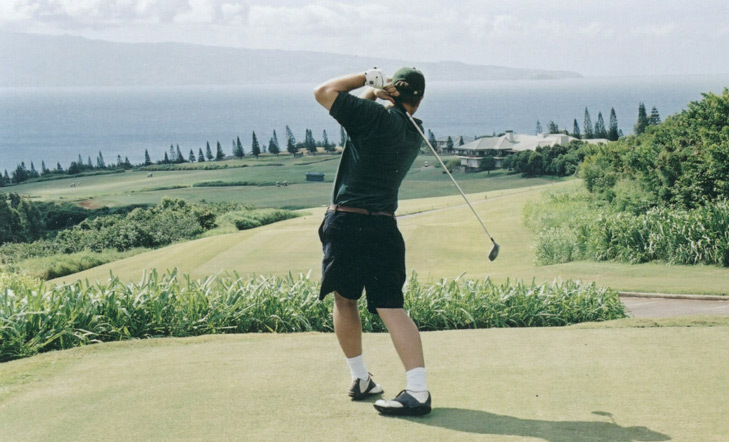 Read More Maui Golf Course Reviews.